Coconut milk is commonly used in food preparations, but did you know that it is also an excellent substitute for cow’s milk? As vegetable kinds of milk lack lactose, it is perfect for anyone who has intolerance or allergy and people who want to decrease the intake of this carbohydrate present in the milk of animal origin. It is also a good option for people who have gastric reflux. Although there are no studies that prove that coconut milk relieves symptoms, those who have reflux should avoid animal milk, which makes the coconut a great alternative. By having fat and fiber, it still promotes satiety, a good digestion and facilitates dieting. It is a good source of minerals, rare in cow’s milk and other drinks that try to simulate milk; it is especially a good source of natural antioxidants like selenium and magnesium and also of essential micronutrients such as potassium, iron, and zinc. To a lesser degree, it is a source of vitamins C and E, which are also powerful antioxidants that protect us from the effects of free radicals. Half of its fat is composed of lauric acid, which despite being a saturated fat, has been shown useful in lowering LDL (bad cholesterol) levels in favor of HDL (good cholesterol), and as a strong antiviral and antibacterial. It is a great regulator of satiety: It has been shown that the special fats of coconut milk lead us to consume an average of 256 calories less per day. This is also because of the fibers contained in coconut milk, in contrast to cow’s milk, which does not contain fibers. A glass of coconut milk is an effective natural remedy to relieve the symptoms of acid reflux. 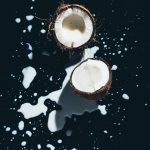 How to consume coconut milk? Coconut milk can be taken every day, but the ideal is to vary its consumption with that of other kinds of milk of vegetable origin, such as peanut, almonds, soya bean, cashew, Brazil nut, and rice, so that there is even more variety of nutrients. Smoothies are refreshing and creamy drinks full of nutrients, which promote satiety and fill the body with health. To make them even lighter, one option is to use coconut milk. Easy to make, just hit all the ingredients in the blender. The trick to making it very creamy is to use only the pulse function until the drink is homogeneous.